1962 • San Francisco ~ At the end of a long day, rather than taking 19th Avenue home after work, Dad occasionally drove home by way of the Panhandle then through Golden Gate Park and past Kezar Stadium. For a few years he had a little black, white-topped convertible Ford. As far as I knew, he never once put the top down. In 1962, he bought a new sky-blue Chevy Impala. We cruised slowly by Stow Lake and counted the squirrels and rabbits, their tails and ears raised in permanent alert—six bunny sightings made for a good evening—then we stopped to watch the bison. The next year when I got my learner’s permit he let me drive. With his hand gripping the door armrest and his left leg jammed into the floorboard, we were unable to unwind and concentrate on rabbits. I put him through the roof the evening I pulled into the driveway on 45th and mistakenly tapped the gas pedal rather than the brake. The car lurched forward when I hit the brake. The front end barely kissed the garage door so the only damage was to Dad’s nervous system, though he was pretty jumpy to begin with. Mid 1960s • San Francisco ~ After Dad and Marie married, I spent my high school summers in the Sunset where there was no such thing as summer. June hits and the fog rolls in, blanketing block after block of adjoining lookalike houses built on sand dunes in 1947. They were all attached, two-story block-long stucco homes painted white or shades of beige with slightly different rooflines, barely different fake balconies, and faintly different front doors. I had to memorize the houses on each side of Marie’s so I could find my way home. Half the time I missed it and had to step out into the street to get my bearings, looking for the Pisias’ peaked roof and upper balcony, the double brown roof and white shelf on the front of the O’Brien’s, and the flat roof on our house in between. You’d think I’d have checked the house number. I also spent a lot of time next door at Nanette O’Brien’s kitchen table where we gossiped about the neighborhood happenings and I complained about Marie. Even though I was embarrassed, I appreciated her when she kindly counseled me about keeping my skin clean and washing my hair more often; I think my hygiene was not that great as I never noticed the caked Clearasil that rimmed my hairline. I secretly wished that she was my mother. Nanette worked as Christmas help for the City of Paris in Stonestown. She started in women’s dresses but ultimately worked in handbags for over 25 years. City of Paris was bought by Liberty House which was bought by Macy’s where she was “the old bag in handbags” until she retired at age 83. 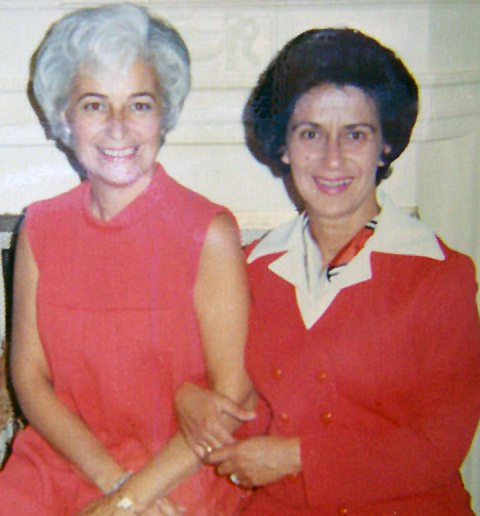 Irene Pianezzi, who lived next to Nanette on the other side, was her best friend. They played double solitaire many afternoons and knocked on the adjoining walls between the houses as a signal to talk to one another out their upper back windows. Their two families celebrated holidays together. 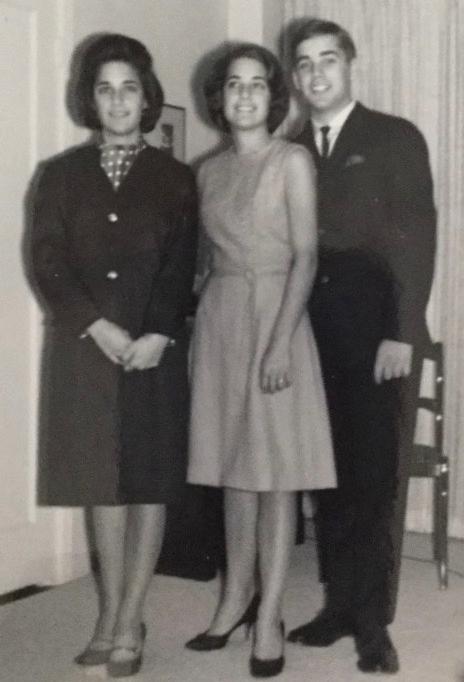 Nanette’s husband was an inspector with the SFPD Juvenile Department; he worked a lot of evening shifts and brought his partners home during their breaks for coffee and Nanette’s homemade cookies. I was friends with their daughter Missy, who was a year older than me, and I avoided their ornery Dalmatian, Daisy, who didn’t like me any more than I liked her; sensing my fear she growled and snapped at me whenever I attempted to slide past her. I hung out with the two younger Sayre boys across the street; their dad left when Jackie was seven and Marie Sayre, all 4’8″ of her, had her hands full with her secretarial job and trying to raise her four wild sons who were often in and out of trouble; she was a computer and could write anything in scribbled shorthand. My other friends were the Pianezzi twins, Diane and Elaine, who were two years older than me, and their brother Phil, who was my age. After Sunday Mass, I’d sometimes hang out with Mr. Pianezzi and listen to the Giants and Dodgers baseball games on his radio while he mowed their strip of front lawn and washed his car. That’s how I knew about Don Drysdale and Sandy Koufax, the two Willies, and the three brothers whose names I loved to roll off my tongue, Matty, Jesus, and Felipe Alou. I didn’t have a favorite team since I lived in both places, but I dared not root for the Dodgers; I didn’t want Mr. Pianezzi not to like me. He was over the moon when the Giants trounced them four games in a row at Candlestick Park that June of ’64. Ms. Sevenau, I am really going to miss your stories. I’m not sure quite why I get excited when your email comes in my inbox. What am I going to look forward to? Thank you so very much for sharing. You’re an excellent writer. Oh Kay, thank you so much. Maybe I’ll continue to post some of my other pieces I’ve written. You brought back many memories of my days on 35th Ave.
Nice! Happy to be a part of it. Love your story as I grew up on 41st & Kirkham. My best friend Loy (Loyola), lived across the street, grew up with me in the 40’s. She went to Holy Name & I went to Francis Scott Key. We played in the school yard and in the street and had such fun. We used to go to Charlie’s Market and shop for our moms. Love the memories! I think my stepsisters may have gone to Holy Name, Irene and Janet McCartney. They would have gone there in the 50s though as they were a bit older than I. They were Mercy girls in high school. I was married in Holy Name Church, which was our parish. Judy, do you happen to remember Harry and Barbara Payne? They grew up at the same time on 41st and Kirkam. Hi Harry, I am so sorry but I do not remember those names. I lived at 1506 41st Ave, 1946-1955. My mom & dad were Harold & Janice Siegel. Oh no. This is over in November? I love these stories. Some of them are tough & confusing emotionally. I get great joy on stories like today’s. I don’t want to even think about my past. Our past holds all the clues of who we are today. If I hadn’t had mine, what in the world would I have had o write about! So nice to see the well kept lawns. Now, the lawns have been cemented over and used as a parking pad. No one seems to have any pride in their property. Love that you are sharing your memories! Thanks for coming along for the ride. I went back a few years ago and the street looked pretty rundown. 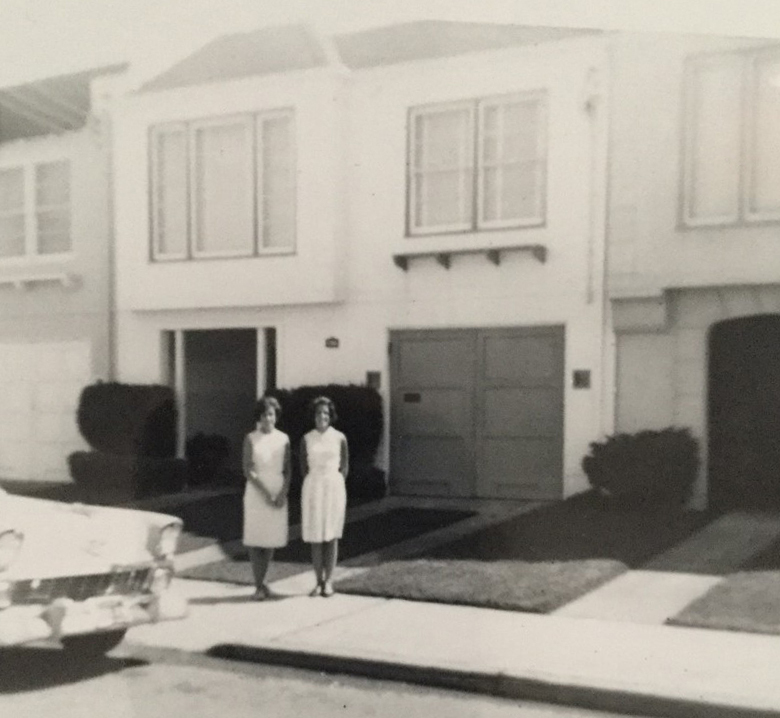 Most who lived there is the sixties sold and moved away. I grew up on 28th Ave…went to St. Cecilia’s. I am a year older than you. I have been back a few times through all the years to see the old neighborhood and it is very depressing. YOUR RECALL IS SO SHARP. ALL FROM YOUR DIARY? No diary. What I remember, what I’ve been told, and what I made up. I also wrote most of this many years ago. I had a better memory then. First photo is a 1964 Ford. Second is a 1956 Chevy. I forgot to ask you or Steven Smith, my go-to car guys! I suppose that as not much of the cars showed in the photo, it didn’t matter. 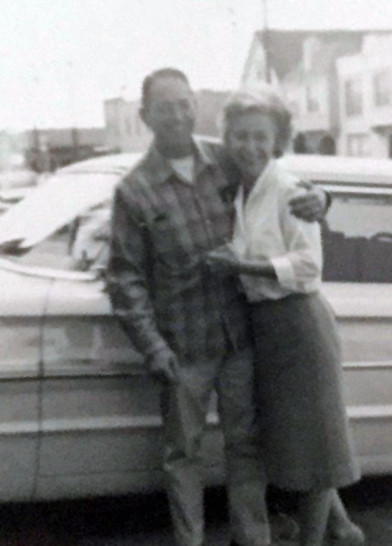 I’ll bet Mr. and Mrs. Pianezzi had that photo taken because their car was new. What wonderful, vivid memories… You describe it so well. (Wonder if the people on that street now even know each other….) I am always looking forward to your next chapter, Cathy. We’ve nearly all stayed in touch, though no one lives on the street any longer. Some chapters are done by committee: My old friend Gail Coffin Crosslin cleaned up and photoshopped many of the pictures, Diane, Elaine, Missy, and Jackie either contributed pictures or added details to the story. All of the parents are deceased, all of the kids are still here. Thanks for reading along. The book is coming to an end in mid November. That will be a good time to close the door.